The FlashHarp® harmonica USB flash drive is the star of The Musical Combo. A mini, playable harmonica that's also a USB flash drive, the patented FlashHarp was born for folks who want to carry their music, pics and videos in a drive that reflects their "realness" and musicality. In addition, inside The Musical Combo's FlashHarp is my 10-minute (1min/hole!) QuickTime video harmonica lesson. More than just “teach” the instrument, I share with you my five basic insights about the harmonica—so rather than putting it down, you start to "pick it up." 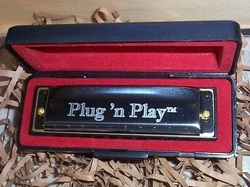 The full-sized Plug 'n Play makes learning single-note technique easier. The bigger the holes, the easier single notes are to "hit." Single-♪ playing is somewhat advanced and easier to learn using an instrument with larger holes, hence the full-sized Plug 'n Play companion. Of course, once you have your single-♪ technique down, your skill will easily translate to the FlashHarp! GB capacity doesn't include formatting, video, and included audio-annotated tab sheet and pdf. Ask about The Musical Combo today! Contact me to add Personalization ($20 extra) to your Musical Combo's FlashHarp or to turn it, as shown below, into a Necklace ($13 extra).